This perennial vine is a fast-growing plant that only grows 6 to 12 inches high. English ivy is often grown as a ground cover outdoors, in rock gardens helping to prevent soil erosion, and climbing up walls, fences or trellises. With green foliage that is variegated with white, pink, or yellow veins and small, white blooms in the fall, English ivy is a relatively easy plant to grow. Grow English ivy outside in fertile soil that is well draining since ivy does not like standing water. Mix organic material such as shredded leaves, compost or manure into the soil before planting. Plant in a sunny location that gets at least four to six hours of full sun daily, although some afternoon shade is tolerated. 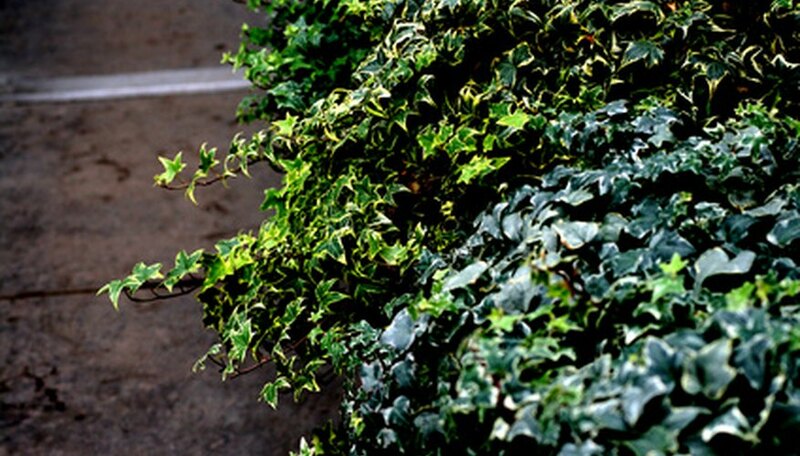 English ivy can survive in low light conditions but it will slow down the growth of the plant considerably. Dig holes that are twice the width and depth as the root ball, and space the plants about 6 inches apart. Loosen the roots of the plants and remove the lowest two to four leaves which helps to stimulate root growth. Plant the ivy deeply in the holes so that the top of the ground is even with the remaining leaves. As you fill in the hole, firm the soil with your hand to prevent air pockets. Add a 2-inch layer of mulch such as shredded leaves or bark. Place around and in between each plant to help discourage weeds and retain moisture in the soil. Water your plants well after planting and keep evenly watered to ensure healthy growth. When the top 1 inch of soil is dry, it is time to water. Use a soaker hose or garden hose with the water left running at a trickle for about 20 to 30 minutes. Fertilize English ivy with an all-purpose granular food (5-5-5) once in the spring after the last frost. Since these plants need very little fertilizer just sprinkle a handful around the base of each plant and water in well. Do not plant English ivy on a south-facing wall where it will get too much heat and die.